The RCSB PDB offers resources for teachers and students; many are described in the recently-published Promoting a structural view of biology for varied audiences: an overview of RCSB PDB resources and experiences (S. Dutta, C. Zardecki, D. S. Goodsell, H. M. Berman (2010) J. Appl. Cryst. 43: 1224-1229 doi:10.1107/S002188981002371X). The use of electron density maps in determining molecular structure is described in the online resource Understanding PDB Data.  Understanding PDB Data: Through text, images, and interactive Jmols, this feature intends to help researchers and educators get the most out of the PDB archive. Broad topics include how to understand PDB data, how to visualize structures, how to read coordinate files, and potential challenges in exploring the archive.  Educational Resources: Many of the educational materials created by the RCSB PDB, including animations, and handouts, are archived here. Recent additions include an updated edition of the Bioinformatics of Green Fluorescent Protein tutorial guide and the How Do Drugs Work? poster and flyer.  RCSB PDB Newsletters and Education Corner: Each quarter, the new developments, outreach efforts, and interviews with leaders in the community are published in an online and printed newsletter. Each Education Corner column, which highlights PDB usage in the classroom, has been archived on a single page. Past Education Corners have featured a rubric for biomacromolecular 3D literacy, the program Molecules for the iPhone, and physical 3D models of molecules.  Molecule of the Month: Each installment includes an introduction to the structure and function of a particular molecule, a discussion of the relevance of the molecule to human health and welfare, suggested additional readings and resources, and interactive views. To illustrate the features and functionality of the RCSB PDB website, online screencasts provide short guides to selected features. A more detailed tutorial is also available at openhelix.com. The RCSB PDB publishes news, tutorials, screencasts, guides, and more electronically. 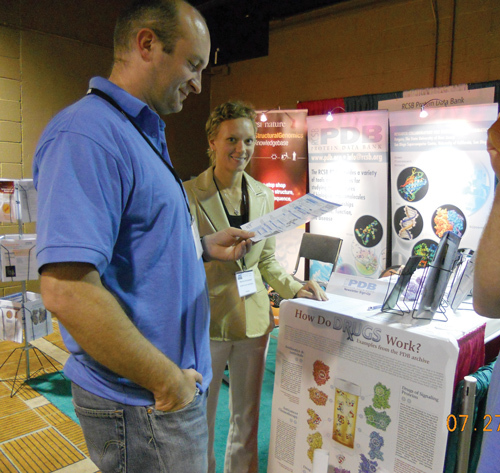 New printed materials are also distributed at the RCSB PDB's exhibit booths at professional society meetings. 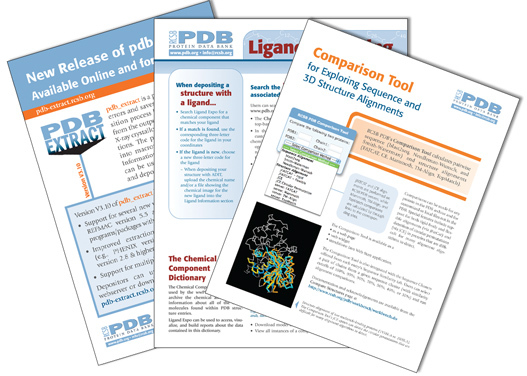 These flyers describe resources of interest to data depositors (pdb_extract, sugar geometry), data users (Comparison Tool, Ligand Searching, Widgets), educators (Educational Resources) and more. Information is also available about related resources, including the wwPDB (Validation Reports and RSS Feed), the new version of the BioSync Guide to Synchrotron Facilities, and the Electron Microscopy Data Bank. For a customized packet of flyers and information for your lab or department, please send your postal address and user type (depositor, users, educator, all) to info@rcsb.org. New flyers are available online or by sending a request to info@rcsb.org. The RCSB PDB awards a poster prize for the best student poster presentation at a number of different meetings throughout the year. For more information about the award, please see www.pdb.org. Mickey Kosloff At the 18th Annual International Conference for Intelligent Systems for Molecular Biology (ISMB, July 11-13; Boston, MA), the award for best student poster in the category of Structure and Function Prediction went to Mickey Kosloff for Structure-based redesign of selective G-protein inactivation by RGS proteins (Mickey Kosloff, Amanda M. Travis, Vadim Y. Arshavsky, Duke University Medical Center). Many thanks to the judges: Manisha Brahmachary, Brian Chen, Fabian Dey, Markus Fischer, Tobias Hamp, Laszlo Kajan, Eugenia Lyashenko, Marco Punta, Shruti Rastogi, Ta-tsen Soong (Columbia University), Avner Schlessinger (University of California San Francisco), and Mikhail Dozmorov (Oklahoma Medical Research Foundation). Thanks also to Poster Committee Chair Yana Bromberg (Columbia University) and to the International Society for Computational Biology. 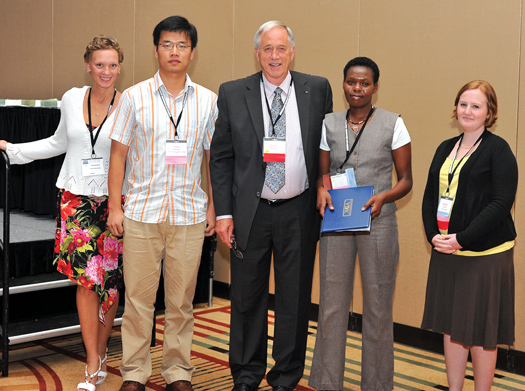 At the 2010 Meeting of the American Crystallographic Association (ACA, July 24-29; Chicago, IL), the award went to Serah Kimani for Catalysis in the nitrilase superfamily amidases: Insights from the active site (Serah Kimani1, Brandon Weber2, Andrew Nel3, Don Cowan3, Trevor Sewell2. 1Molecular and Cell Biology Department, University of Cape Town, 2Electron Microscope Unit, University of Cape Town, 3Department of Biotechnology, University of the Western Cape). Serah also won the award in 2007. Marina Zhuravleva (RCSB PDB), Yuan Cheng, Michael James, Serah Kimani, and Jennifer Cash at the ACA Banquet & Award Ceremony. Honorable mentions were made to Yuan Cheng (A uniquely open conformation revealed in the structure of a novel protein arginine Methyltransferase, Yuan Cheng, Monica Frazier, Matthew Redinbo University of North Carolina at Chapel Hill) and Jennifer Cash (The structure of the muscle growth inhibitor myostatin bound to follistatin 288: Insights into receptor utilization and heparin binding (Jennifer Cash1, Carlis Rejon2, Alexandra McPherron3, Daniel Bernard2, Thomas Thompson1. 1University of Cincinnati, 2McGill University, 3National Institutes of Health. Many thanks to the ACA judges: Michael James (University of Alberta), Cheryl Klein Stevens (Xavier University), Bi-Cheng Wang (University of Georgia), Eric Ortlund (Emory University), and Charles Carter (University of North Carolina at Chapel Hill). Thanks also to Poster Committee Chair Victor G. Young, Jr. (University of Minnesota) and to Marcia Colquhoun and the ACA. 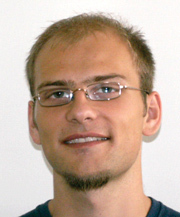 Sven DahmsSven Dahms received the poster prize at the 26th European Crystallographic Meeting held in Darmstadt, Germany (August 29 - Sept 2) for Structure and biochemistry of the APP E2-domain (Sven O. Dahms, Dirk Roeser, Manuel E. Than, Fritz Lipmann Institute, Jena, Germany). Many thanks to the judges: Wolf-Dieter Schubert (Helmholtz Centre for Infection Research) and Norbert Straeter (University of Leipzig), and to Andreas Roodt, Petra Bombicz, and the European Crystallographic Association. Visitors to the RCSB PDB/PSI SBKB booth at ACA learned about new features such as wwPDB Validation PDFs, the latest version of pdb-extract, the Comparison Tool for sequence and structure, and much more. In addition to the poster prize award, the RCSB PDB exhibited alongside the PSI SBKB at the ISMB meeting. 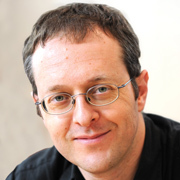 At the 3DSIG satellite meeting on Structural Bioinformatics and Computational Biophysics, Andreas Prlić presented New RCSB PDB protein comparison tools for sequence and 3D structure. 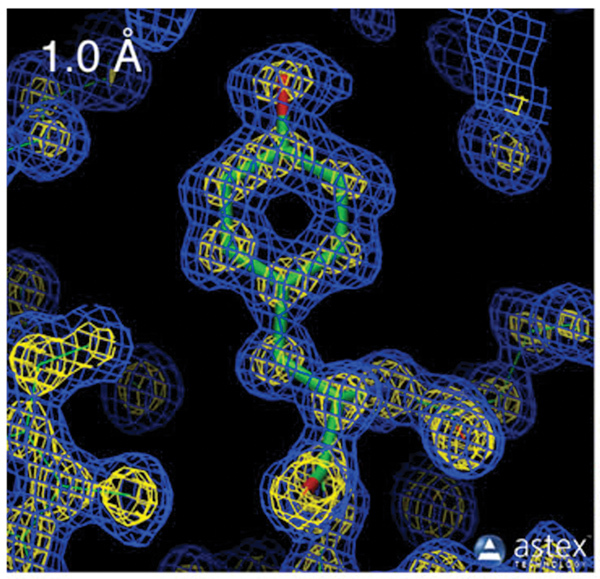  The Molecule of the Month's David Goodsell participated in the ACA's workshop for high school teachers called Crystallography: World of Wonders.  A PDB Depositors' Lunch was held update users on the wwPDB Common Deposition and Annotation Tool project and collect feedback.  A poster describing the wwPDB Common Annotation and Deposition Tool Development. David Goodsell presented Getting the most out of the Protein Data Bank at the Educator's Luncheon Workshop at The 24th Annual Symposium of the Protein Society (August 1-5; San Diego, CA). Also at this meeting, Andreas Prlić presented a poster entitled Detection of remote similarities in protein structures in the RCSB PDB that illustrated the functiona- lity of the RCSB PDB's Comparison Tool. Several events happened at the American Chemical Society's Fall National Meeting (August 22-26, Boston, MA). At the PDB and Chemistry symposium, presenters explored all aspects of the chemical components found in the PDB archive. A presentation on Using molecular structures from the PDB for a visual and exploratory learning experience in biochemistry was part of the Advances in Teaching session. Batsal Devkota, Monica Sekharan, and Chenghua Shao and the ChemLuminary Award. For more on the award from the ACS, see bit.ly/bsYNl2.The North Jersey Younger Chemists Committee, led by RCSB PDB annotators Monica Sekharan (Chair), Bastal Devkota, and Chenghua Shao (Vice Chairs), was awarded the ChemLuminary Award for Outstanding New Local Section. As part of the BioCreative III Workshop on Critical Assessment of Information Extraction in Biology (Sept. 13-15, Bethesda, MD), Andreas Prlić talked about the integration of open access literature with the RCSB PDB using BioLit and his work with the Distributed Annotation System protocol for exchanging biological data. Director Helen Berman described the history of the PDB archive and the formation of the Worldwide Protein Data Bank organization at the Wolfram Data Summit (Sept. 9-10, Washington, DC).